PLEASE CALL (360) 698-2448 OR E-MAIL info@bremertonbb.com FOR AVAILABILITY INFORMATION. Deposit - A 50% down payment in the form of cash, money order, check or credit card number is required in order to place reservation. Balance including tax will be due upon arrival. Cancellation - Notice given with more than 10 days prior to reservation date will result in refund minus $25.00 service fee per room. Less than 10 days we will refund minus the service fee -if we are able to re-book. 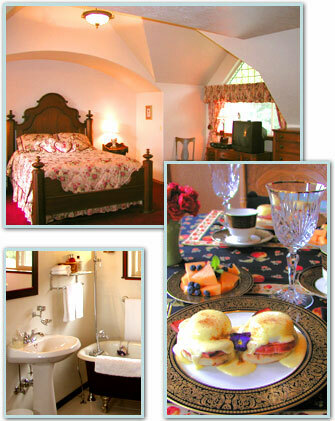 Rates shown are per night, single or double occupancy with breakfast included. We are kid and pet friendly. With consideration to other guests prior approval and fee is required . There is plenty of flat parking space for all types of vehicles. Victorian Rose room has additional sleeping if needed. Reserve the whole inn for that family gathering. Three queen beds,1 full, 2 cots, lots of carpeted floor space. Flowers, champagne, wine, cheese, cracker ect. can be provided upon request.